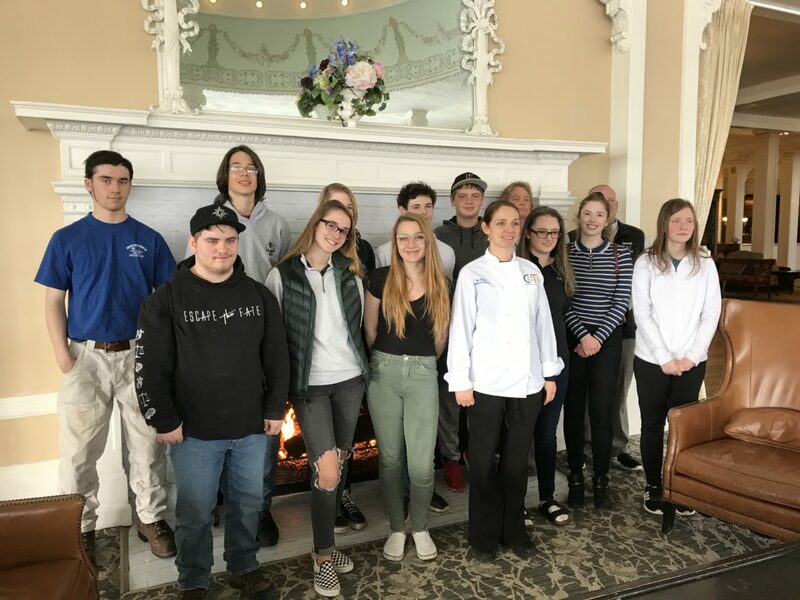 Mount Washington Valley Career and Technical Center students and Alison Bickford, MWVCTC culinary arts instructor, (center front) enjoyed a tour of the Omni Mount Washington Resort during New Hampshire Hospitality month. 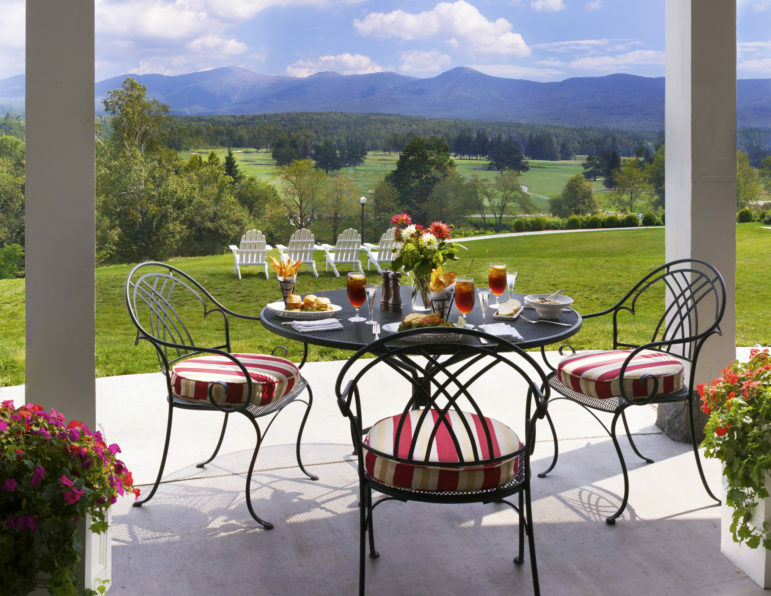 You could say New Hampshire’s economy banks heavily on the hospitality and tourism industry. In fact, according to New Hampshire Department of Education’s The Hospitality and Tourism Career Pathway’s fact sheet, hospitality and tourism is the second largest industry in New Hampshire. New Hampshire’s reliance on this industry is seventh in the nation. In an industry that employs 68,000, with over 84,000 jobs depending on tourism and hospitality, Gov. Chris Sununu proclaimed the first Hospitality Month in April of 2018. Hospitality Month was organized and developed by New Hampshire Lodging and Restaurant Association. The second annual Hospitality Month runs the month of April. NHLRA and the New Hampshire Sector Partnership Initiative have worked together to identify challenges in the industry – it is no secret that finding and retaining staff is on everyone’s mind. During Hospitality Month, middle school and high school students tour establishments. The goal is to spark an interest and see what “A day in the life” is like at restaurants and hotels. Amie Pariseau, education and workforce development director, NHLRA, talks a bit about last year and gives the scoop on numbers. “Feedback from last year was positive. I engaged a group of extended learning coordinators by taking them on a tour. This opened their eyes to what the industry is about. Some of their schools are participating this year,” said Pariseau. “In 2018, we had 20 middle, high schools and community partners, 320 students, a community college demonstration day, 29 industry sites and 39 tours,” added Pariseau. This year the projected numbers include 44 middle schools, high schools and community partners, 13 of which are from 2018. Some are CTE programs or students doing a career exploration. Some students are in a business class and having a hospitality focus is not necessary to participate. Pariseau explains further that there are 600 to 700 students this year, a community college demonstration day, 60 industry sites and 70 tours. North Country participants include the Omni Mount Washington Hotel and the Mountain View Grand. “Students did want a little more hands-on or interactive experience. For the most part our tours have that, it depends on the size of the property and staff,” explained Pariseau. Speaking of hands on, the Omni Mount Washington Hotel hosted its second group of 11 students from Mount Washington Valley Career and Technical Center (Kennett High School) on Tuesday April 9. The first group of 30 students from Plymouth High School met on Thursday, April 4. During Tuesday’s tour, students were greeted by Josh DeBottis, general manager of the Omni Mount Washington Resort. Following the introduction of Craig Clemmer, director of sales and marketing, students were led on a historical tour of the hotel by Clemmer. Clemmer, well-versed in the history, presented a most colorful and detailed discussion of the grand hotel and its grand Madame, Caroline Stickney, citing opulence and pop among the motivators behind the hotel. Today, the hotel and resort is a full metropolis operation. Thoughout the tour, students learned about hotel history, rooms division, sales, marketing, food and beverage, front-of-the house, culinary and ski operations. They were treated to lunch provided by Bretton Woods Culinary Academy. The Brian Wu Junior Culinary Program, a weeklong summer program was created by Gorham Middle High School and White Mountains Community College in 2017 and has been sizzling for two years. The program, named in honor of Brian Wu, a Gorham Middle School student who was killed in a car accident in 2007, has been supported by the Brian Wu scholarship, sponsored by WMCC, with scholarship funds provided by the Agnes Lindsay Trust. Brian’s family created the scholarship fund; Brian loved to cook. The culinary program teaches other juniors basic kitchen skills, knife skills, baking skills, pasta, sauces, soup making and the techniques of searing and sauteeing. “Last summer we had 18 students, the majority were young men, who came to explore cooking and hospitality. They started at the beginning making meats and vegetables, then at the end made a big meal for the sponsors,” stated Tamara Roberge, project manager, community and corporate affairs, WMCC. Speaking of sponsors, because the scholarship funding was for two years, the program will not be able to continue for a third year this summer unless new sponsors are found. “The tuition is $400, a large cost for the program is the food which is expensive and you can’t cut,” said Roberge. The Brian Wu Junior Culinary Program was well received. “The college, activity-based learning experience was embraced by the parents of the students,” added Roberge. Roberge continues that after seeing the impact the program had on students, GMHS and WMCC would like to collaborate again. The culinary program serves Gorham, Berlin, Milan, Groveton and Lancaster. Often children in these communities are recognized as underserved. If the program does not continue, many would not be able to attend the culinary camp and acquire useful learning skills, teamwork and leadership, she said. The Omni Hotels has paired with White Mountains Community College to offer a three-year Culinary Apprentice program. Future chefs will train in food operations with a variety of chefs. They will receive an Associate in Science Culinary Arts degree the program will begin in August 2019. After completing the program, students will have a minimum of 5,000 hours in all aspects of the kitchen and will have gained the experience to work in any Omni property or food and beverage establishment. This is an apprenticeship where students will be paid. Tuition at White Mountains Community College is additional. Culinary Apprenticeship Program click here. Associate in Science Culinary Arts, click here. Northland Restaurant, Gale Street, Canaan, Second Thursday every month.April 11, 6:30 p.m to 8:00 p.m.
Get ready to get wet and have some fun in the spring time. Saturday, April 13 from 1 to 2 p.m. This workshop will explain the HUBZone program, how it works and eligibility. All of Sullivan, Grafton and Coos counties qualify. Passumpsic Savings Bank, 1 Gardner St., Newport, Vt., Contact: VT PTAC (802) 828-5237 Tuesday, April 16 from 10 a.m. to 2 p.m. In the second of 3 hands-on marketing workshops, participants will continue to develop their marketing strategies and focus more on the market research necessary to identify and segment their market. 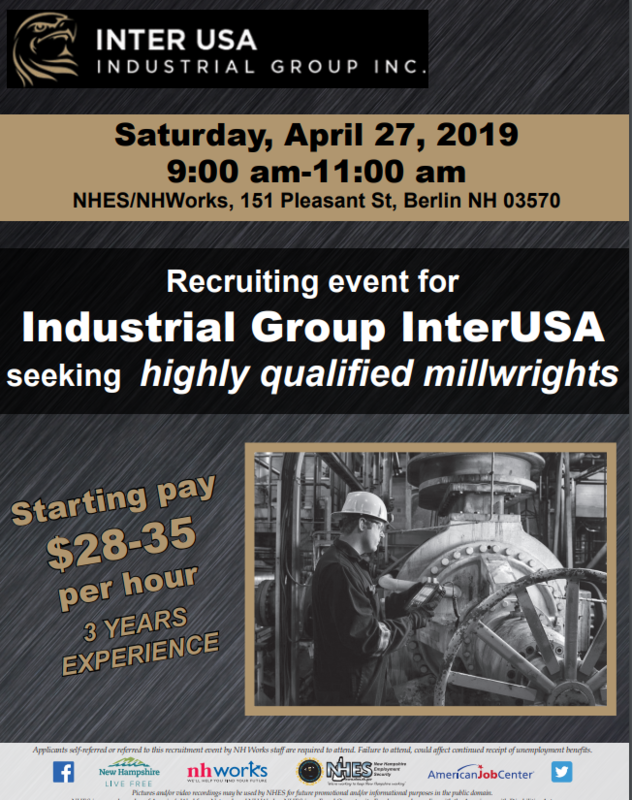 Tuesday, April 16, 9:00 a.m. to 10:30 a.m.
White Mountains Community College, 2020 Riverside Drive, Berlin, JobFair@nhes.nh.gov. 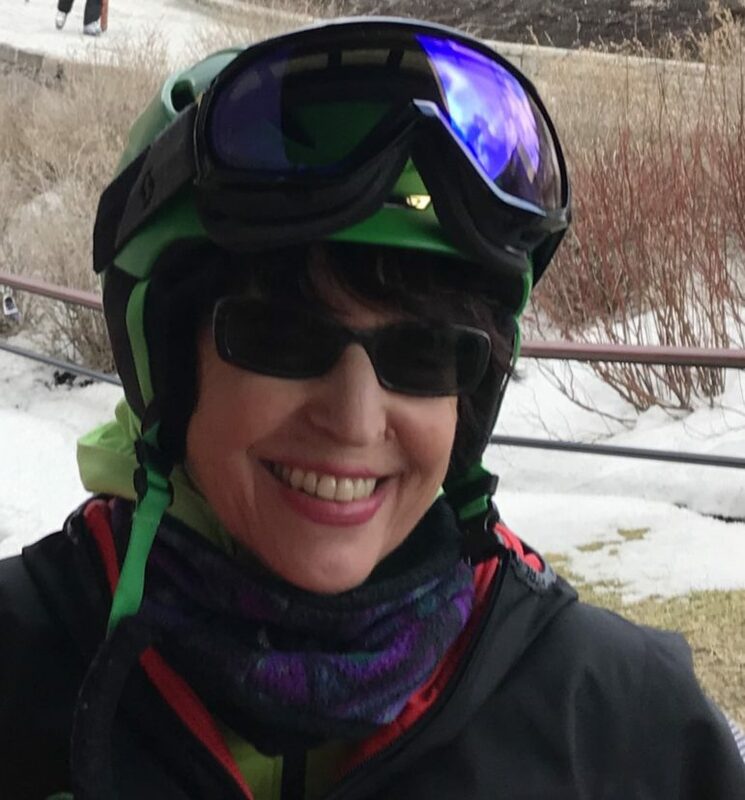 Kate LaPierre, 603-228-4083, Wednesday, April 17, 10 a.m. to 2 p.m.
Tickets, $15, www.gnwca.org, 603–246-8998 Saturday, April 20 at 7 p.m.